Why has Battlefield V become a Call of Duty Clone? This game is nothing like cod and it is not on an annual release cycle and 99.9% of players demand customization in the games they play. That's why just about every game has it. So every point you made was 100% wrong OP. So either you're trolling or delusional. i wanna see the year when Cod will look as good as BF . The environment looks great sure, but character movement, animations and models are not. Do they even use mocap in BF? And what's up with the cartoonish flared trench coats that everybody seems to be wearing? These COD comparisons are utterly ridiculous, apart from both being shooters they are nothing like each other. Uh... Lol... Maybe the prominence of trench coats on multiple fronts in ww2? Many officers even wore them in to battle. 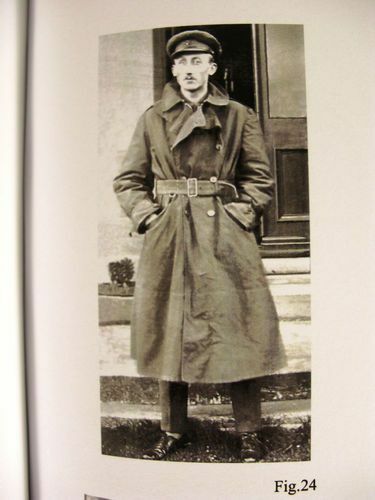 Trench coats were literally developed for military officers. Not very cartoonish at all. The annual release cycle is sickening, hopefully they can make it two years before they try and milk everybody again. it is 2 years. bf1 is out for 2 years. you do known that mocap is used in Madden and FIFA which use the Frostbite engine that Dice created right?? And bf is a game that uses the same engine??? So I take it that Dice didnt get real ww2 soldiers to do the motion capture so that is why it is cartoony. That makes sense.....😒 to noone. Yeah, but not with a flared, rolled up edge like the ones in game. I do know that they have a facility for mocap but if DICE did use it for their shooters then why all the soldier movement animations look exactly the same from SWBF 3 years ago to BFV? Same robotic unnatural movement. This doesn't feel like it at all. The animations for player movement are almost identical to SWBF and BF1, but hardly robotic or unnatural. Anyone who has worked on animations knows the Battlefield series has traditionally had some of the best. I don't know how Dice work but I imagine there's a team dedicated to the core dev work of a new game, with some of that team retained to output DLC and updates. There's probably a different team whom work on Battlefront games and another responsible for the frostbite engine. Also the customisation in BF5 is nowhere near as in-depth as BF4 was - that had 4x gun types for each class, each with reticle, grip, barrel and mag mods. There were skins for guns (over 100 of them) plus outfits for your avatar and a gazillion dog tags. You aren't considering the fact that DICE is releasing other titles now along side Battlefield. They work on BF for a 1 year cycle timeframe then move onto Star Wars or whatever other trash EA gives them to do. Then they let the worse studio(s) work on BF, some of which are under the DICE umbrella name but do not have the same talent or ability as Sweden's original DICE, leaving no hope of the franchise ever getting properly developed. Then, of course, this is combined with the fact that high level individuals at DICE have been leaving the studio en masse since BF4. This has been perpetuated since after BF3 came out, and it's no coincidence Battlefield has gone to complete and utter garbage since then. Soooooooo leave then. Why hang around a forum for a game you think is trash? Any example of that? Because the coats currently in the game look like that of coats usually seen in combat. I know for a fact that the Canis Horriblis coat is a red-collared general's great coat. What is inherently cartoonish about the coats in the game compared to thier real life counterparts? Do you mean that some of the coats are open and pushed back? If so, such is the case for most long coats in battle. Men have to unbotton tight coats to sit down, let alone sprint full speed through battle. Unless it's in winter I doubt very many officers ran into battle with thier coats buttoned and uniform. Pretty much all the coats. They are too slim fit compared to WWII era coats. All the uniforms in this game just don't look like WWII uniforms, especially the German ones with all the insignias and collar tabs missing. The ammo pouch vests? What is that? Why can't they make authentic looking uniforms like these ones? I Agree with the OP and would also like to point out that most everything about your profile, achievements, customization, etc are all stored server side, not on your local device. My point is that the game would run much smoother and loading times would be much improved without the plethora of server side coding to call up every little thing about your player. I'd like to have a straight FPS game with little customization, no achievements and focus on game play and mechanics. Let's get back to what made Battlefield great in the first place. They are very unnatural. Just look at the sprinting animations, very unrealistic. Oh, and holding a pistol pointing upwards when you run? Who does that, really? Amazing how some customization bothers people. Eh, you learn something new about the weirdness of humanity every day. I'd say this is a valid gripe if not for BF never really having an authentic art style. It's almost always stylized. In modern BF games you have everyone running around looking like masked ninjas instead of regular grunts. BF1 probably didn't have a single authentic uniform in the whole game (Austrian scout was probably closest but even he was wearing more of an early-mid war German uniform). Lots of it looked like some alt universe medieval or steampunk mashup with all the plate armor, capes, silly out of palce hats/helmets and other embellishments. I think BF2 was probably the outlier and the one that stayed mostly authentic to around a mid 2000s setting.